Explore Bhutan and learn more about the Land of the Thunder Dragon. 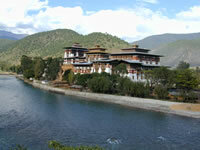 The Explore section is filled with fun and useful information on traveling to Bhutan with Yangphel Adventure Travel. The Learn section contains a rich and comprehensive selection of information about Bhutan and it's people. We hope you enjoy it. In Bhutan, it is 12:35:46 PM on Monday, April 22, 2019. All information in this web site is the property of Yangphel Adventure Travel and may be re-used or reprinted by written permission only.